Remember the Alien TV Story? A medium-sized, nocturnal mammal native to Africa, the aardvark is also known as an “antbear”, “anteater”, or “Cape anteater”. I don’t know how often participants in night-time game drives spot these elusive animals, but we have lived in aardvark territory for several years and have never seen one! The name comes from early Afrikaans, and means “earth pig” or “ground pig”, because of its burrowing habits. And amazingly, they are not related to South American anteaters or pigs but to elephants, elephant shrews, and hyraxes. 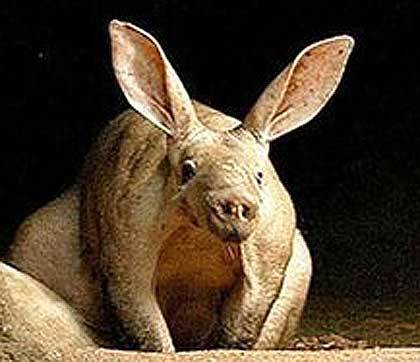 The aardvark does look vaguely pig-like with a stout body and arched back and the thick skin is thinly covered with coarse hairs. The thick-based tail adds to the general bulky look and the snout has a disc-ish look to the end (like a cartoon piggy), which is the nose. Aardvarks Glow in the light? 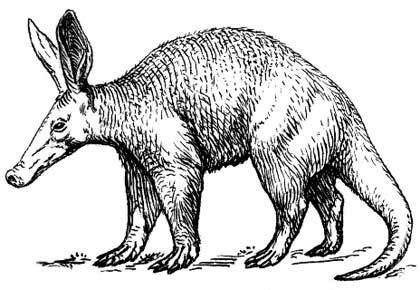 Aardvarks are a pale yellowish-gray, which changes to a reddish-brown (or grey) when stained by the soil of the anthills and termite mounds where they feed. They can also get quite big with large specimens reaching a length of 2.2 meters (7ft 3in) including the tail and a weight up to 65 kilograms (140 lbs). Certainly, my one sighting had convinced me that they were at least as big as a Rhino… but as it turns out, not quite – maybe a tiny Rhino! These unsociable creatures live in sub-Saharan Africa, in Savannah, bushveld, and desert; wherever the ants and termites that make up their diet are plentiful. These they catch and eat using their long, sticky tongue. Fortunately, the lack of sightings has very little to do with a vulnerable conservation status – the populations are robust. Their shy, reclusive and solitary nature, coupled with the odd hours they keep, just make them very hard to spot on a regular basis!